and specificity of ultrasound were determined by cross-tabulation of the ultrasound and surgical findings. should be considered for the diagnosis. A definitive diagnosis remains challenging. sigmoid colon may help to prevent torsion . differentiate it from other etiologies. pelvic pain suggestive of ovarian torsion. than 6 hours of the ultrasound assessment were in cluded. and their frequency distributi ons were measured. ultrasound diagnosis was made in each surgical diagnosis. 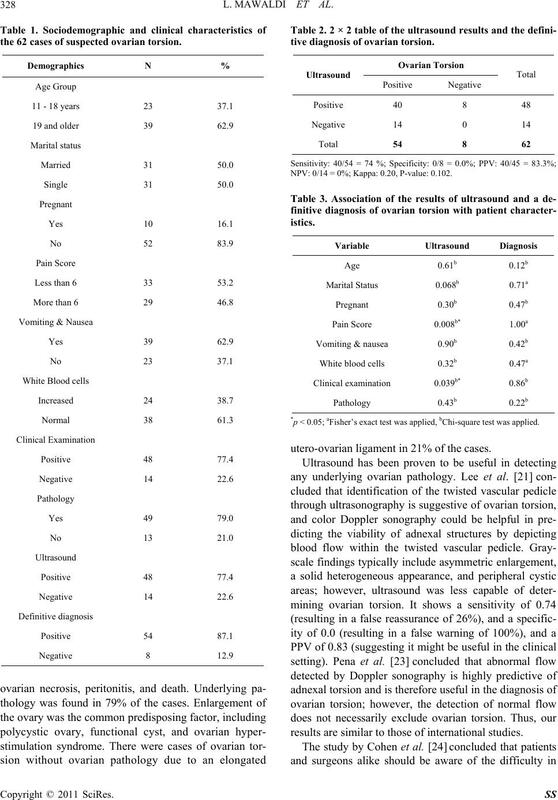 ovarian torsion cases (false positives). the PPV reaches 87%, and the yield is 74%. 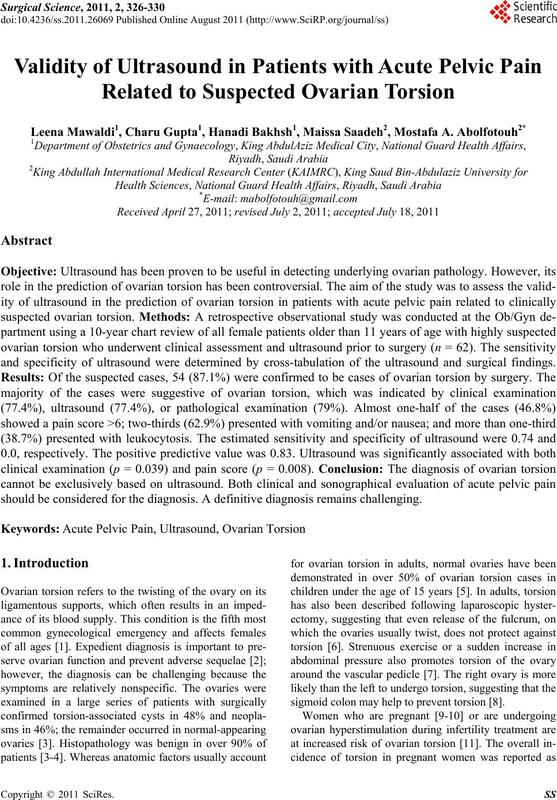 the 62 cases of suspected ovarian torsion. tive diagnosis of ovarian torsion. NPV: 0/14 = 0 %; Kappa: 0.20, P-value: 0.102. *p < 0.05; aFisher’s exact test was applied, bChi-square test was applied. utero-ovarian ligament in 21% of the cases. results are similar to those of international studies. Table 4. 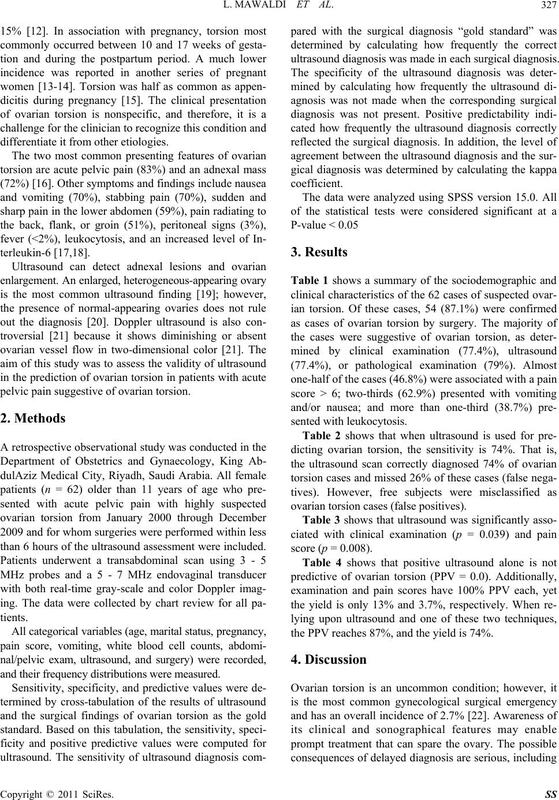 Predictive value and yield of different criteria for the diagnosis of ovarian torsion. 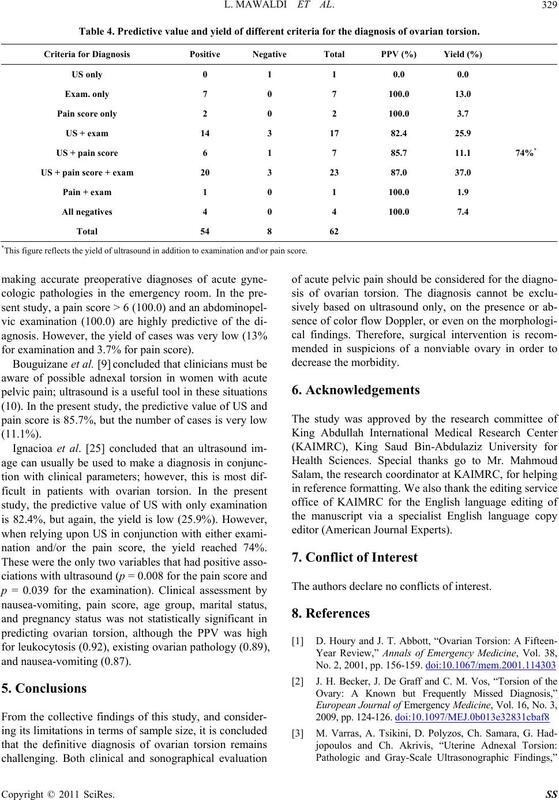 *This figure reflects the yield of ultrasound in addition to examination and\or p ain score. for examination and 3.7% for pain score). nation and/or the pain score, the yield reached 74%. Clinical & Experimental Obstetrics & Gynecology, Vol. 31, No. 1, 2004, pp. 34-38. M. Sommerville, D. A. Grimes, P. P. Koonings and K.
Vol. 164, No. 2, 1991, pp. 577-578. Vol. 159, No. 6, 2005, pp. 532-535.
scopists, Vol. 11, No. 3, 2004, pp. 336-339. Human Reproduction, Vol. 18, No. 8, 2003, pp. Pediatric Surgery, Vol. 39, No. 5, 2004, pp. 746-749. No. 1, 2004, pp. 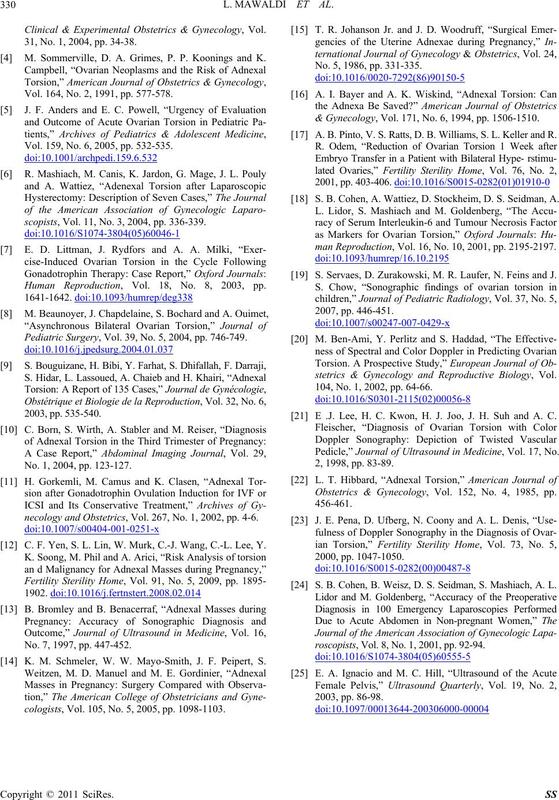 123-127.
necology and Obstetrics, Vol. 267, No. 1, 2002, pp. 4-6. C. F. Yen, S. L. Lin, W. Murk, C.-J. Wang, C.-L. Lee, Y. No. 7, 1997, pp. 447-452. K. M. Schmeler, W. W. Mayo-Smith, J. F. Peipert, S.
cologists, Vol. 105, No. 5, 2005, pp. 1098-1103. No. 5, 1986, pp. 331-335. & Gynecology, Vol. 171, No. 6, 1994, pp. 1506-1510. A. B. Pinto, V. S. Ratts, D. B. Williams, S. L. Keller and R.
 S. B. Cohen, A. Wattiez, D. Stockheim, D. S. Seidman, A.
man Reproduction, Vol. 16, No. 10, 2001, pp. 2195-2197. S. Servaes, D. Zurakowski, M. R. Laufer, N. Feins and J.
stetrics & Gynecology and Reproductive Biology, Vol. 104, No. 1, 2002, pp. 64-66. E .J. Lee, H. C. Kwon, H. J. Joo, J. H. Suh and A. C.
Pedicle,” Journal of Ultrasound in Medicine, Vol. 17, No. Obstetrics & Gynecology, Vol. 152, No. 4, 1985, pp. S. B. Cohen, B. Weisz, D. S. Seidman, S. Mashiach, A. L.
roscopist s, Vol. 8, No. 1, 2001, pp. 92-94.